Golpla Grass and Gravel pavers often assist designers to comply with the requirements of Building regulations Part M whilst providing the opportunity to achieve aesthetically pleasing surfaces as alternatives to asphalt or concrete. A surface designed to accommodate wheelchairs should be firm, durable and slip resistant. As a consequence loose gravel surfaces are deemed inappropriate. Similarly hoggin, compactable subbase or self binding gravel have a tendency to rut and become muddy in wet conditions due to the high fines content. When using Golpla with a decorative clean angular aggregate it is possible to create an aesthetically pleasing surface that allows access for wheelchairs in a variety of weather conditions without issues of rutting. Access from the boundary or car parking space should ideally be level or have a maximum gradient no steeper than 1:20 Golpla can be installed on slopes up to 1:15 for vehicular traffic and has been slip tested for pedestrian use. Designated wheelchair parking bays should be clearly marked and afford room for a wheelchair user to gain access to their car at the side and rear. 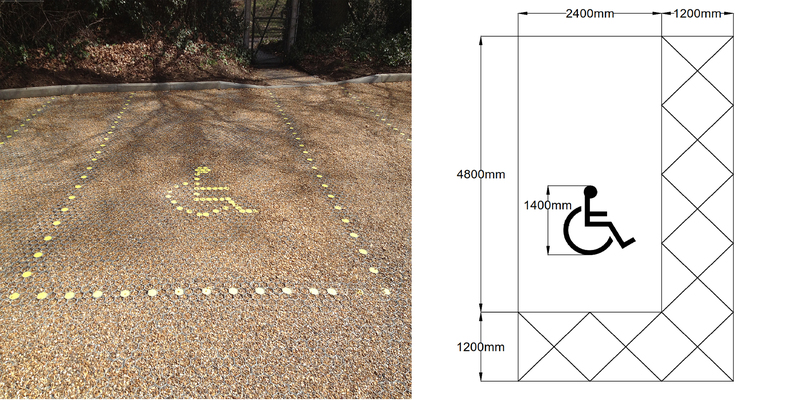 Golpla markers can be used for demarcation to create parking bay perimeters and wheelchair symbols. The markers are shaped to fit the hexagonal unit design, provided a flush fit. The markers clip into the Golpla cells securely just below the unit surface preventing trip hazards.